Born to Armenian parents, Arsinée Khanjian grew up in Beirut, Lebanon, an unstable country at best. Her parents fled to the safety of Canada in 1975 and settled in Montreal. The then the 17-year-old was strongly encouraged by her family to relentlessly pursue an education. Studying at Concordia, she received an undergraduate degree in Spanish and French. She began a master`s degree in political science at the University of Montréal. Fate though would have a hand in her future plans. Upon meeting Egoyan, Khanjian transferred to the University of Toronto and was later convinced by him to star in his first film, Next of Kin in 1984. Khanjian won a 1999 Gemini Award for best actress in a series for her work in Foolish Heart. She was given a Genie Award in 2003 for Best Actress for her role in the feature film Ararat. The 2017 film, Last Car, is directed by John Greyson. 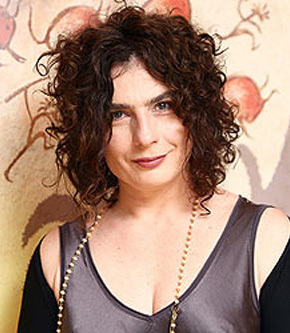 Learn more about Arsinée Khanjian. 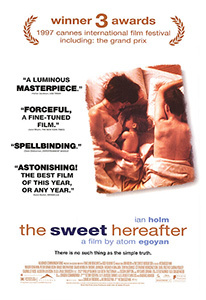 This poster for The Sweet Hereafter was scanned from an original in the Northernstars Collection.